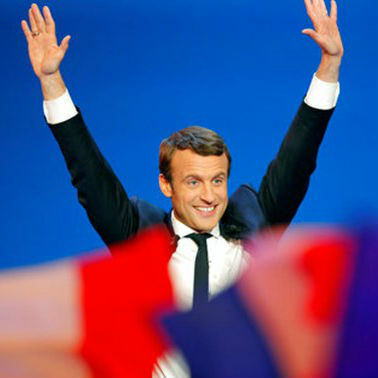 Greece > News > Emmanuel Macron, Europe's climate hero? French President Emmanuel Macron is following through on his vow to "make our planet great again" by pledging 30 million euros for climate research. DW asked two prominent French climate scientists what it΄s all about. DW: France recently pledged 30 million euros ($33.4 million), to match what it hopes will be another 30 million euros from universities and other organizations, making a total of up to 60 million euros to fund the work of up to 50 climate researchers over five years. What is your reaction to the initiative? Jean Jouzel: I was at the meeting with Emmanuel Macron, and also NGOs, about climate change issues when he initially announced it [without the funding] last Tuesday. I was really surprised at first. My first reaction was not so positive because at that time, the main point was that if there is no additional money, it will be very difficult. So I understand from the announcement on Saturday that there will be additional money, which is nice - I think it can be positive at the end if we succeed in attracting bright scientists from abroad and indeed at our institute, we have had four applications already. Valerie Masson-Delmotte: The initiative is the followup to a promise made during his electoral campaign and repeated when the president of the USA announced the retreat of his country from the Paris Agreement. In the last few days, more details have been given to explain how this initiative would be implemented in practice. I strongly support any initiative from France, Europe and other countries to offer "scientific asylum" for scientists as there is a large risk of loss of knowledge and know-how. The risk is for US science, as well as for international climate science efforts. From France΄s announcement on Saturday, it΄s not yet fully clear whether the funding will be open only to foreign scientists and scientists based abroad working on climate research, or whether French scientists based in France would also be eligible. I understand that some French scientists have expressed frustration that they may not directly benefit from this funding. How do you feel this initiative is being received in France? JJ: It΄s not clear for me either, when you look at the announcement. I suspect there will be a priority for American scientists, because this was the initial idea. So there seems to be priority for American scientists, and for scientists working abroad - but it seems it could possibly be for a French scientist working abroad, working in the US to come back to France. But nobody knows who will apply, how many people will apply, so I think it΄s relatively open. We need funding in France, we need also support in the laboratory, new positions in our field because there΄s a growing interest in climate issues. I understand very well this feeling that we need more money in France. V M-D: The current situation for French science funding is far from being satisfying. Recurrent funding for laboratories is very low; and there are fewer and fewer opportunities for early career scientists in research agencies and universities to find a permanent position. While French research is still highly competitive, due to the dedication and "value for money" (considering low salaries), this is not a sustainable pathway. At the same time, French research is highly integrated at the international scale, and the National Center for Scientific Research (CNRS), for instance, is hiring at least 25 percent of scientists from other nationalities, interested by academic freedom associated with the French researcher status. The [funding] initiative is not designed to improve work conditions for French research in general. It is designed to promote France as a host country for progress associated with climate science and science-based solutions, and committed to support the Paris Agreement. Do you think many climate scientists, particularly scientists from the US, will take up Macron΄s invitation made in a viral web video for them to move to France and contribute to research there? V M-D: In fact, I learned about the webpage associated with this call from scientists from other counties when I was at a meeting in the United Kingdom. Several scientists had approached me with practical questions, to which I had no answer at the time. JJ: I was skeptical, but this is just one week on, and there are already applications at my institute. What is your view of Macron and his commitment to climate change? V M-D: As for many other countries, environmental issues were very low-profile during policy campaigns and election debates. It seems that Macron is willing to take visible leadership on these issues. Let us wait until we see what will be the decisions taken by our new government on environmental issues. JJ: I feel that this [funding initiative] is a sign of Emmanuel Macron΄s interest in climate change issues - that President Macron, as I feel it, wants to support our field of research. I feel it΄s also a political issue, and I really think the country which will take leadership on this climate change issue will take the leadership of this world. That΄s also from an economic viewpoint. The decision of [US President Donald] Trump to withdraw from the Paris Agreement is a mistake, its clear, for me. Macron understands very well this aspect. The new economy will have to take care of the climate issue. Macron has interest [in the climate], but he also has interest as a politician in a good sense of the term. This is leverage for his political action at the European level. Valerie Masson-Delmotte is a French climate scientist and co-chair of one of three working groups on the Intergovernmental Panel on Climate Change (IPCC). Jean Jouzel is a French glaciologist and climatologist, and former vice-chair of the IPCC, who won the 2012 Vetlesen Prize, considered to be the earth sciences’ equivalent of a Nobel award. These interviews were conducted by Melanie Hall.